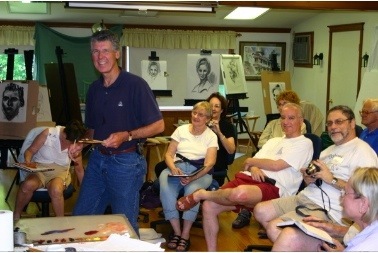 Everyone has such a great time in a workshop with Paul Leveille. 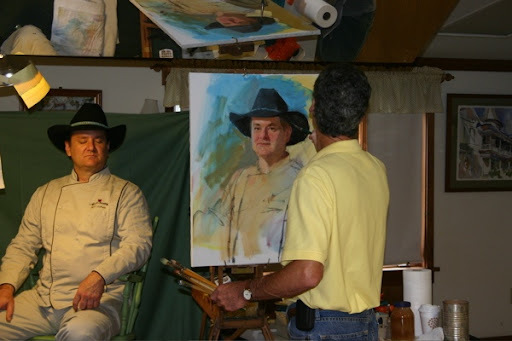 If you are interested in portraits, whether you have never tried them or are an experienced painter, Paul is the teacher for you! Here are more snapshots from this week’s workshop. This is Paul and Chick. I love the lighting in the photograph. This is Gus, a good friend of Paul’s, who came along just to observe the class, but enjoyed a little sketching himself when he wasn’t sitting in as a model in the evenings. 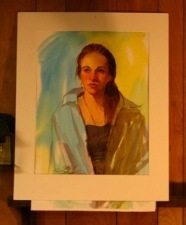 This is the result of Paul’s watercolor painting demo on Wednesday. When the class wasn’t painting, they were enjoying the fine cooking of Chef Mark. 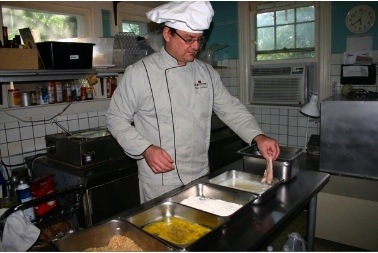 Here he is preparing his Italian Breaded Chicken. He also makes fresh bread every evening. A real treat! Look at all those smiling faces. The week went by too quickly. 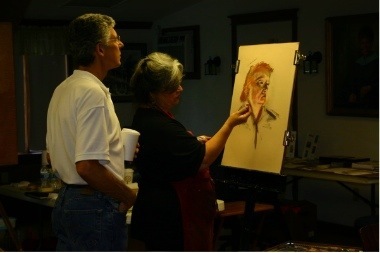 Today the 3-day pastel workshop with Margaret Dyer checks in. This class is full, but the one after this with Karen Rosasco still has a couple of spot open. 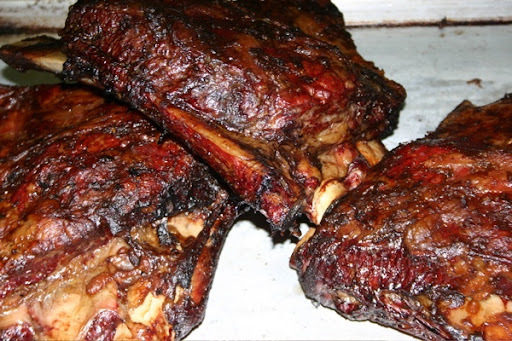 Check it out on our website. 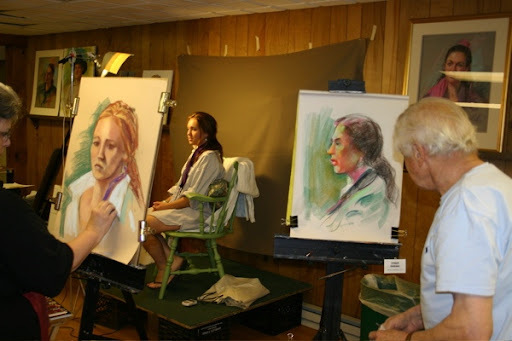 Paul Leveille has returned once again to Hudson River Valley Art Workshops to teach his amazing class in painting expressive portraits. 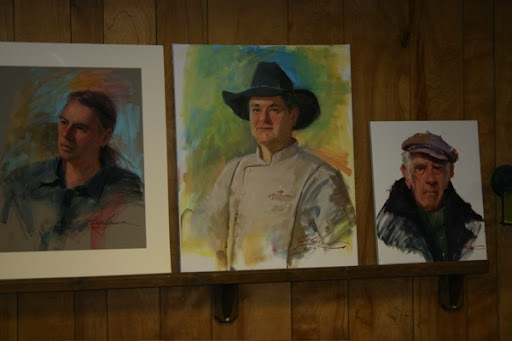 He is fluent in oil, watercolor and pastel and does a demo in each. 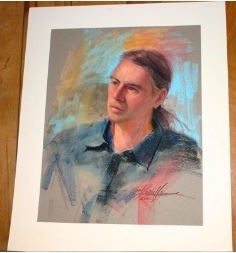 This is the portrait from his pastel demo on Monday. 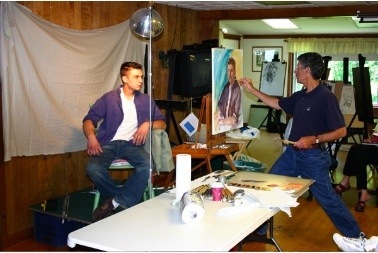 Our model that day was Rudy V from Rhinebeck, who is an artist himself, besides being a professional artist’s model. 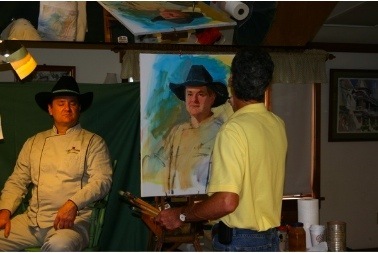 The next afternoon, Paul did a demo in oil. 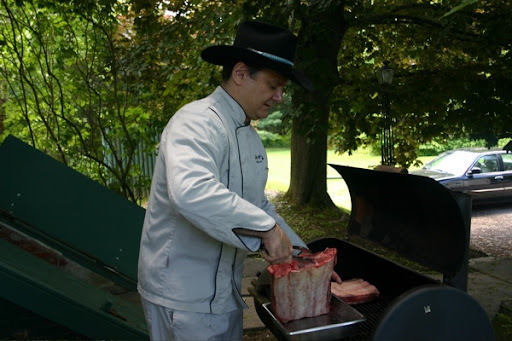 This time the model was none other than chef Mark, who was in a Texas BBQ sort of mood, so he wore his chocolatier whites but with his black Stetson. 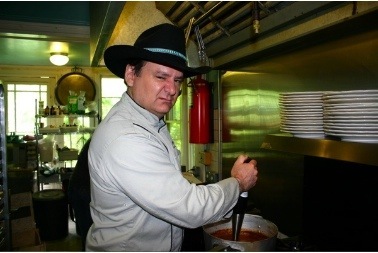 This may seem unusual to some, but you have to remember that Mark lived 9 years in Texas and that means sometimes the hat and boots appear in his outfits from time to time. 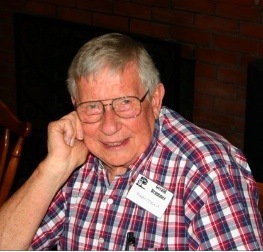 Here is Paul as he is about to get started. 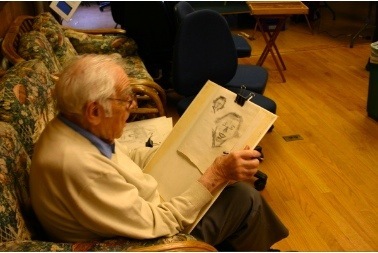 First he used charcoal to sketch the basic shapes and to establish the position of the features in portrait. Then Paul does his portrait dancing magic and suddenly the portrait is just about done! The subject and artist are happy with the results. Paul even got the Life By Chocolate logo on the jacket. There was a reason for the BBQ frame of mind. In between sitting for the demo, Mark was BBQ’ing some huge beef ribs with his special homemade BBQ sauce. 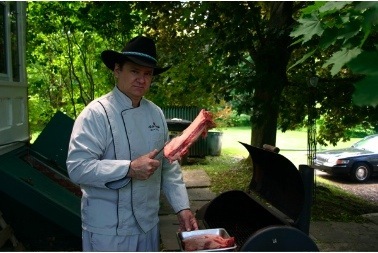 Here he is about to put the ribs on the grill. 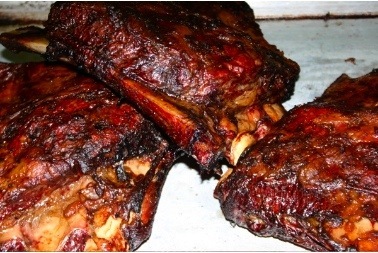 Look at the size of those ribs! 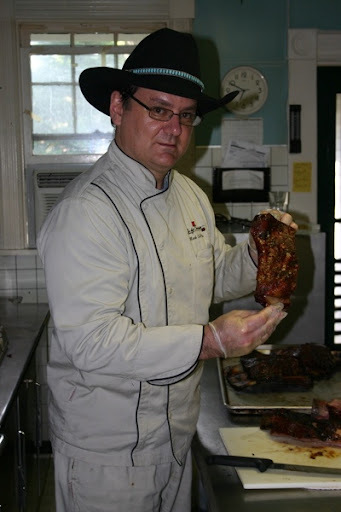 This is Mark giving his best Texas sneer. 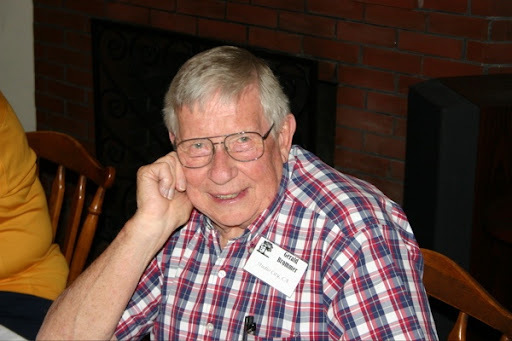 I told him to either smile when I took his picture or give me a good cowboy sneer. He choose the sneer! 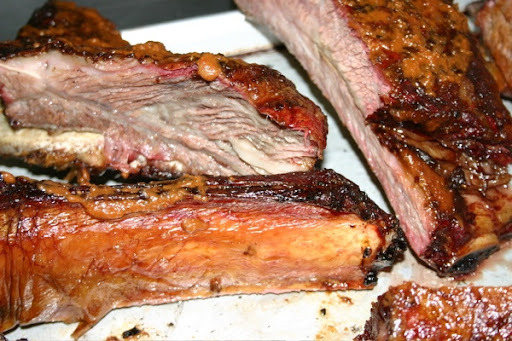 The 4+ hours slow-cooking on the grill yielded these mouth-watering ribs. 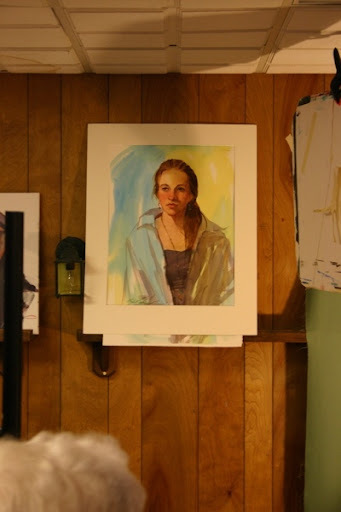 Yesterday, Wednesday, the class had another model. This time it was Heather W. from our town. Here are some snaps of the students hard at work. 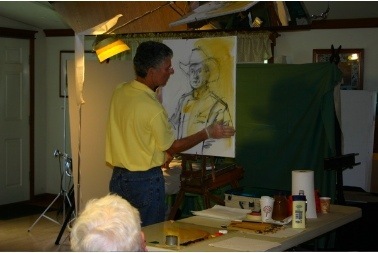 Paul did a demo in watercolor that evening, but I haven’t taken a picture yet. I’ll do that today. This is Jaieur B, who is from Hong Kong and is staying for the Margaret Dyer workshop, too. 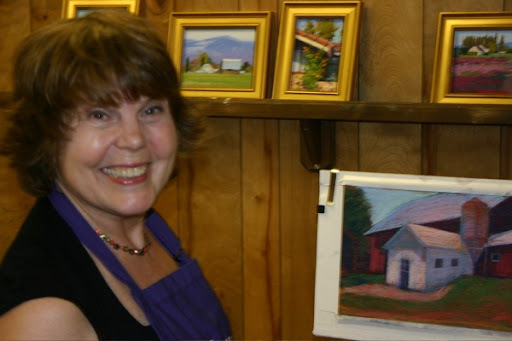 This is Ann C. from Naples, FL, who is a frequent participant at the Hudson River Valley Art Workshops. 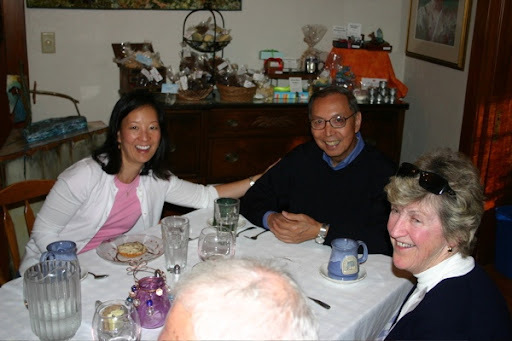 Here you can see Heather, Chick (in the middle) and Len. Here is a closer view of Chick and Len’s portraits. Today more portrait fun is on the schedule. This time they will have two different models, one in the morning and one in the afternoon. 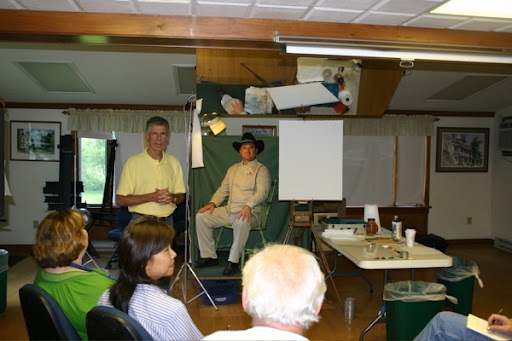 How can you beat a 5-day workshop with Gerald Brommer? 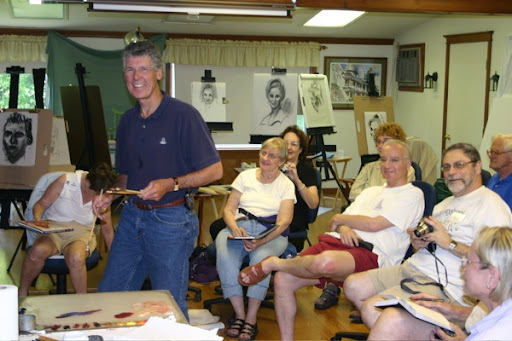 Jerry has been teaching workshops for more than 30 years and has written a multitude of books on art, including Emotional Content: How to Create Paintings That Communicate and Watercolor and Collage Workshop: Make Better Paintings Through Mastery of Collage Techniques. Not only is Jerry a fabulous artist and wonderful teacher who encourages and inspires, but he is a genuine nice guy! He always buys the wine for the first night of dinner. 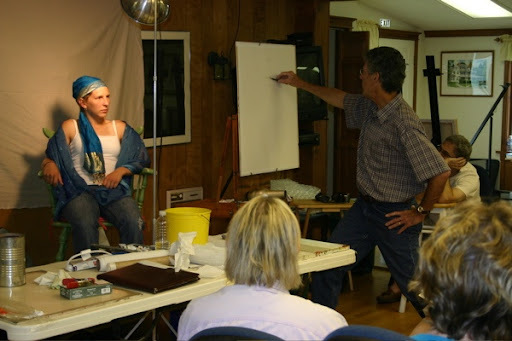 The dates of the workshop are August 2 – 8, 2009. This year Jerry is teaching his Stained Papers and Collage workshop. 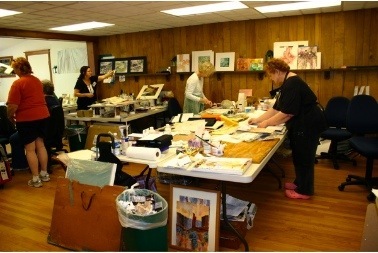 This studio course is designed to take you in new directions, using either acrylics or watercolors, combined with collage. You will learn how to abstract natural landscape resources in order to create vivid, exciting images. This unique workshop features some design exercises which lead directly into designing with subject matter of your choice. 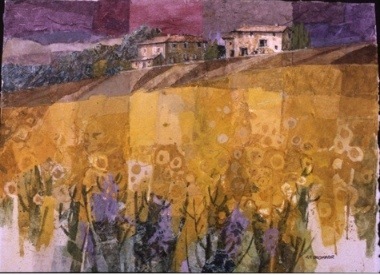 Emphasis is on exploring ways to create strong, colorful, unique landscape imagery that is truly personal and different. 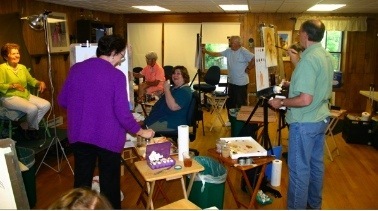 Don’t wait too long to sign up for this great class. 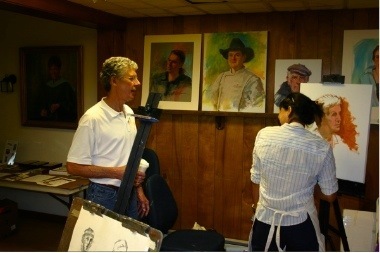 Jerry’s classes usually fill up pretty quickly! Call us at 888-665-0044 to sign up or ask questions! 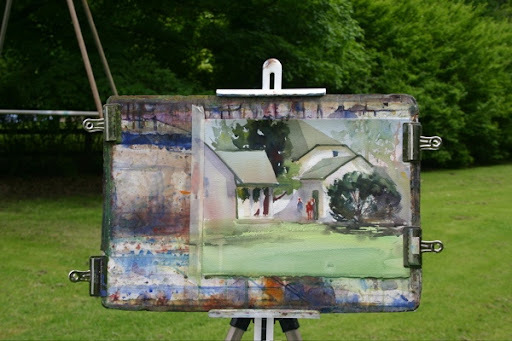 It was a wonderful week with Judi Wagner, master impressionistic watercolorist, and co-author of several books on painting, including The Watercolor Fix-It Book. It was hard to move this group away from the dinner table on most nights. Judi kept everyone entertained with her ready stream of thought provoking questions and stories. Alan L., one of the students in the workshop who came all the way from California, was joined mid-week by his daughter, Amy, who was also from CA. They stayed an extra night after the workshops to have the chance to explore our area together. A great pre-father’s day thing to do. Both had a wonderful time. 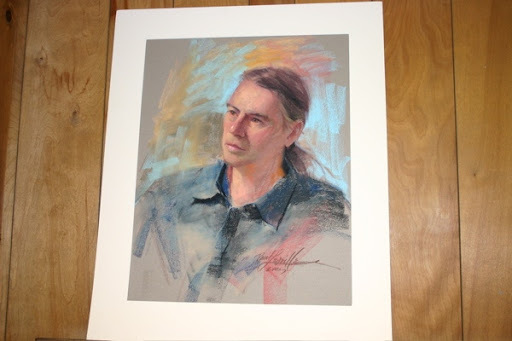 Paul Leveille is returning to the Hudson River Valley Art Workshop June 21 – 27, 2009 to teach his fabulous Expressive Portraits workshop. He does a demo each of the first 3 nights – one in oil, another in pastel, and another in watercolor. He demos are really performances that you don’t want to miss! Here are some snapshots from his 2007 workshop demos. You’ll work with a different model each day and learn Paul’s step-by-step approach to capturing the expression of your subject. 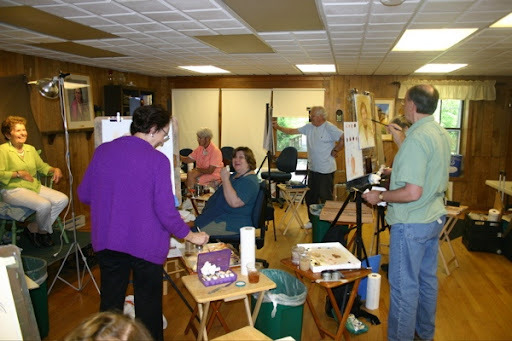 There is still some room in this workshop, but don’t delay! 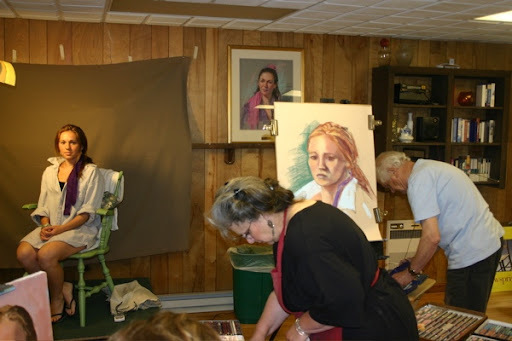 The class dates are coming up soon. 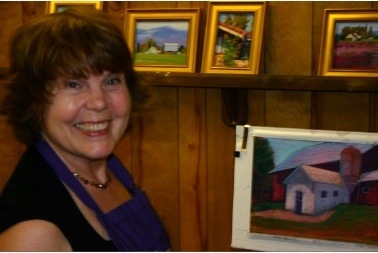 Susan Ogilvie was here last week to teach a pastel workshop. Susan has been here a number of times and it is always great to have her back. Susan arrived a day early to scope out a couple of great farms as painting locations. 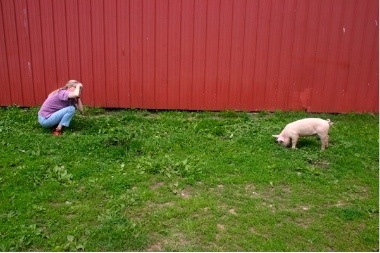 Here is Susan snapping a portrait of one of the farm residence! 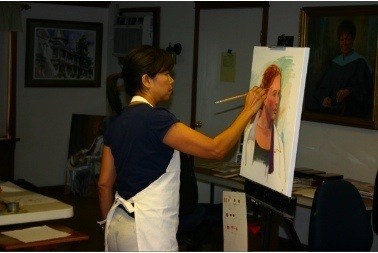 The class usually spent the morning in the studio preparing their pastel surfaces using Susan’s technique. This is Donna S. with Susan. 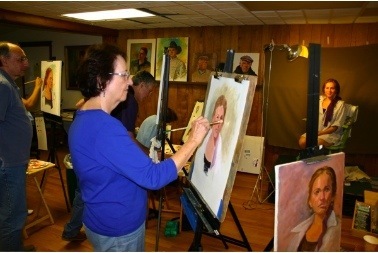 Donna struggled with her paintings on one of the days, but you can see by this mile-wide grin, she had a fabulous time in the class. 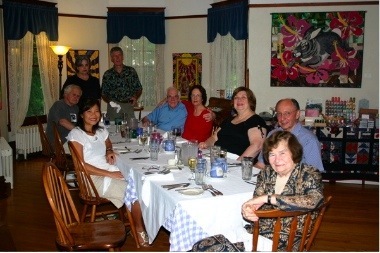 This group really had a lot of fun at the dinner table, telling stories and laughing a lot. 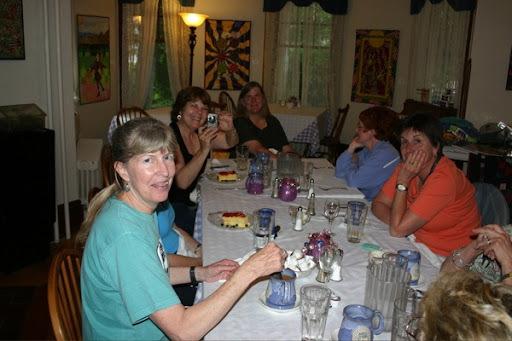 It was hard to get them to leave at the end of the evening so that the tables could be set for breakfast! The week went by too fast. 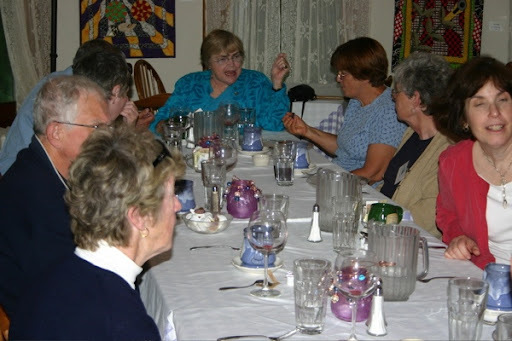 Everyone had great things to say about Susan and her teaching methods. 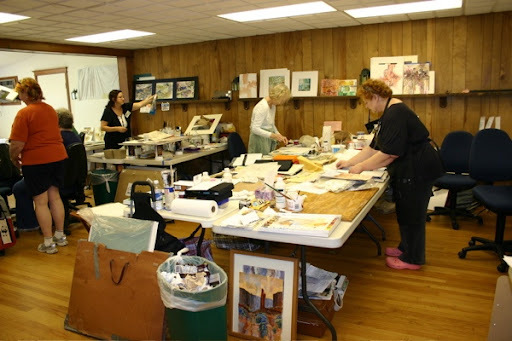 “Her teaching skills are great – emphasizing the basics – a lot of individual attention to encourage you to experiment,” said Judy B.
Susan is sure to be back at the Hudson River Valley Art Workshops to teach again, so when her name show up on our schedule – sign up quick! I just received our copy of the new book, The Complete Idiot’s Guide to Girlfriend Getaways by Lisa Kasanicky and Hudson River Valley Art Workshops is written up on pages 148 – 150! 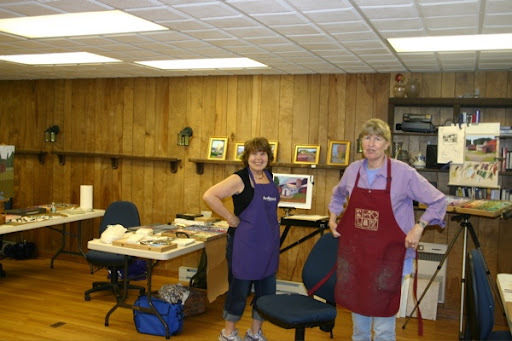 I had spoked with Lisa, the founder of ArizonaSpaGirl.com, more than a year ago when she interviewed me for information about our workshop program. I was really excited about this book because it can be hard to find good girlfriend getaways AND mother-daughter getaways places. 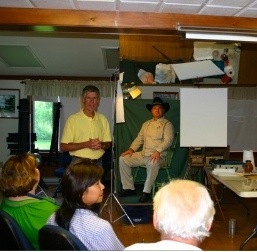 Paul George, a wonderful watercolor artist and teacher from Gloucester, MA was here this week to teach a 5-day workshop. The weather was beautiful all week even though the forecasters kept predicting rain. On the first day, the group stayed close to the inn, just in case of rain. 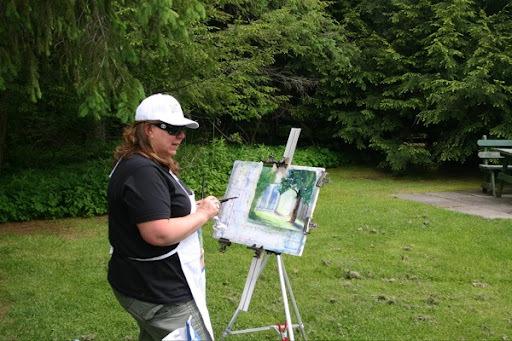 Here is Lorraine painting out near our carriage house. 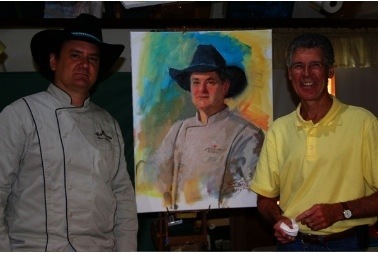 This is the demo painting the Paul did in the morning. It shows the back of the carriage house. A good time was had by all after class at the dinner table, too. 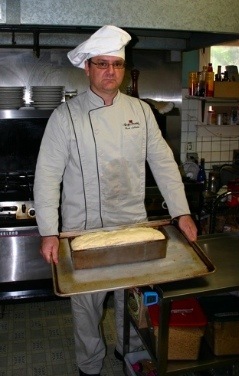 Here is Chef Mark showing off his freshly made Feather Bread. 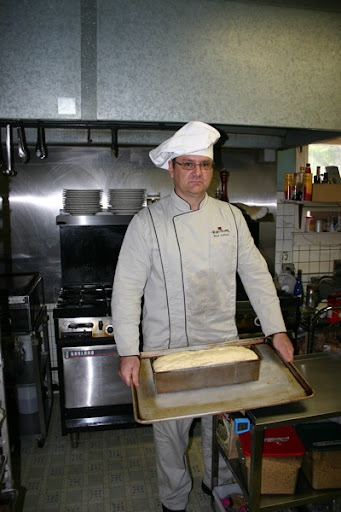 The bread for our dinners is always made fresh that day and is usually coming out hot from the oven right to the dinner table. Yum! On another note, we have added a couple of new items to our wine and beer menu for this year. We now have a couple of the award winning beers from the North Coast Brewing Company in Fort Bragg, California – Red Seal Ale and Blue Star wheat beer. I use to frequent the north coast in the Fort Bragg/Mendocino area and remembered this brewery fondly, so I’m happy to now have some of their beers on our menu. Also added to the menu is Woodchuck Draft Cider from Vermont. We currently have the Granny Smith version and will soon be adding the Amber cider. You may not know it but our parent company is called Woodchuck Ventures, Inc., so when I found a product called woodchuck, I just had to check it out. I found six pack at a store in Albany and brought it home for testing! Well, it definitely passed the test. 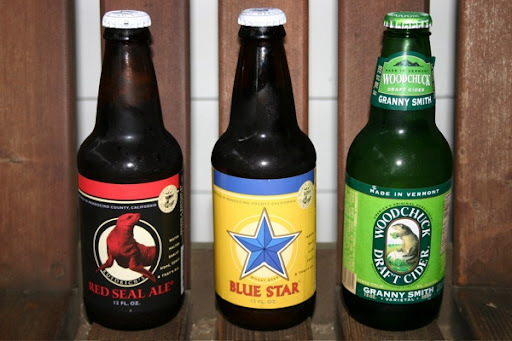 Delicious and refreshing – and has a cute woodchuck on the label! 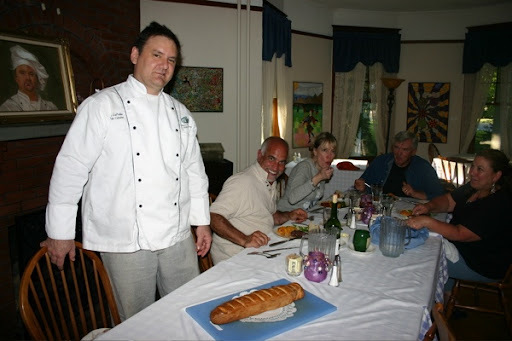 We have quite an extensive wine and beer (and now cider) menu at the inn – over 100 items. And now for the even better news – I’ve reduced the prices on just about all of the items on the menu! Cheers!